Mouse House, Inc. specializes in antiquarian prints, custom mirrors, and the fiber arts of Susan Lenz in Columbia, South Carolina, USA. This blog is being written and maintained by J. Steven Dingman, PhD...co-owner of Mouse House, Inc. The Mouse House has survived the winter blast from last week. 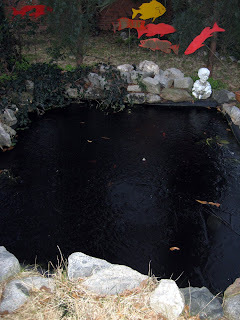 My fish pond froze over for several days and we actually had some snow this past Tuesday. I took pictures and videos but they were terrible, even to my standards, and not worthy of publication. I inserted one for your enjoyment. In typical Columbia fashion, they closed all public schools due to a threat of snow. Susan was entertaining a visitor to her Cyber Fyber show from California who was quite amused with the panic of Columbia residents when inclement weather approaches. Her flight left on-time during our snow event. Yesterday we entertained Seia Rassenti and Joseph Watson (her boyfriend), who are ballet dancers with North Carolina Dance Theatre in Charlotte. Seia graduated with Mathias at The Kirov Academy in DC. They were best friends at school. They came down at our invite to watch Columbia Classical Ballet's Lifechance Gala, and they had a chance to meet several invited dancers including Brooklyn Mack, who dances with Orlando Ballet. He also went to The Kirov, is from Columbia (Elgin) and graduated a year before Mathias and Seia. Seia had not seen Brooklyn for several years, and he did not know she was coming. Susan got some great photos and will be posted on her blogs in the near future. Maybe she will write a review of the evening?!? Mathias should be returning to England from China today. His company, Birmingham Royal Ballet (BRB), has been on a three week tour and have danced in Shanghai, Beijing, and another city. Susan will be visiting next month for 9 days and will get a chance to see their opening performance of Sylvia at the Hippodrome Theatre in Birmingham. Susan, her mother, and myself will be travelling to London in mid April to see their performances at the London Coliseum. Greetings from The Mouse House. My goal for 2009 is to post on a weekly basis the goings-on of The Mouse House. Susan is now consumed in the final planning stages of her International Fiber Arts Exhibition show to be held from January 8-20 at Gallery 80808, 808 Lady St. in the Congaree Vista. Please visit her Cyber Fyber blog for all the details of the show. 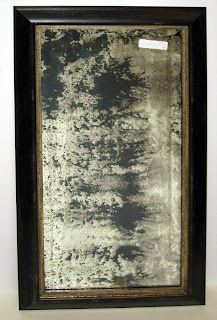 The Mouse House is please to announce that we now have a source for antiqued mirrors. They can be ordered both as either heavy or light antiqued, beveled or unbeveled. They have a wonderful 3-D effect when examined at close range. 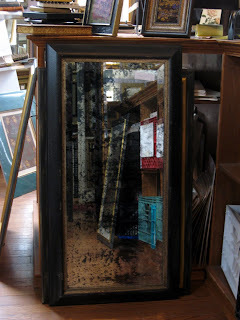 The mirror shown below is a heavy antiqued example and is priced at $360.00 (frame size is 20" by 39"). Please call, or better yet, visit us for estimates for other sizes and frame styles. Please remember to visit Terrace Oaks Antique Mall in Charleston where we offer a wide selection of framed antiquarian prints and large Audubon reproduction birds. Also remember that if you trust Susan's selections of frames and matting choices, we can frame your pieces.